Organizations require accurate insight on global concerns. Harris SpaceView™ small satellite imaging systems provide critical situational awareness in small, affordable packages. When incorporated into constellations, SpaceView™ imaging systems enable faster revisit rates and greater coverage. Designed for use with smallsats, SpaceView™ models 50, 65, and 70 are high-resolution payloads with low SWaP. These models are tailored to support the needs of a variety of industry—like agriculture, oil and gas, emergency response, and more—by offering diverse sensor capabilities and broad spectral range. 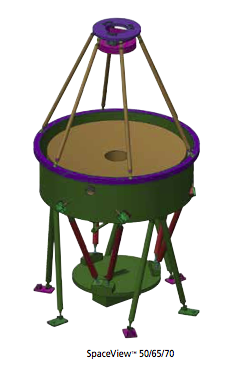 SpaceView™ models 50, 65, and 70 contain high-quality optics and offer the ability to use two different camera modalities in one payload. With two camera configurations on board, system coverage grows dramatically, providing an expanded area of interest for tracking and analysis, while addressing multiple mission needs.